The voyage to Fiji was the last for Syria as she ran aground on the Nasilai Reef, only four miles from shore, at 8.30 p.m. on Sunday 11 May 1884 with the loss of 59 lives. This was the worst maritime disaster in the history of Fiji. On this fateful voyage, the Syria left Calcutta on 13 March 1884 carrying 497 passengers. Its journey was uneventful except that the route, through the Indian Ocean and traveling south of Australia to utilise the prevailing winds, took only 58 days which was two weeks less than expected. On sighting Kadavu at 9 a.m., the captain failed to allow for the strong winds and currents and consequently the ship was closer to Nasilai Reef than the captain believed. By 7.00 p.m. there was a full moon and had a lookout been posted on the mast-head, disaster could have been averted as the breakers would have been visible from a long distance. At 8.15 p.m. the ship was only half a mile from the reef when the breakers were sighted. The Captain took desperate measures to turn the ship but was unsuccessful and the Syria ran aground at 8.30 p.m.
Five of the six lifeboats were destroyed by the heavy seas and on the sixth, four crew members went to look for assistance. They reached Nasilai village at dawn but their inability to communicate with the natives resulted in them being taken to Levuka instead of Suva. On reaching Levuka at 5 p.m. a rescue party was organised and they reached the stricken ship at 9 p.m. Dr William MacGregor, the Chief Medical Officer and Acting Colonial Secretary, took charge of the rescue operations on the morning of Tuesday 13 May. When the first rescue boats reached the scene, the majority of the passengers were in the water on the reef, making as far towards the land as they could, but a considerable number were still in the wrecked vessel, chiefly women and children. The ship lay on her port side. The masts were all broken into fragments, and sails, ropes, and debris of all kinds were mixed up and thrown about in the breakers in wild confusion. The remains of the ‘Syria’ wrecked on her maiden voyage to Fiji, May 11, 1884. 59 people died and the bodies that were removed were buried near Nasilai. 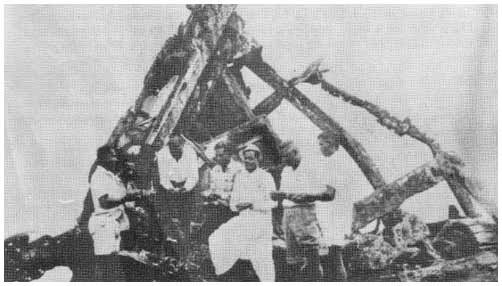 This picture was taken in 1969 and shows members of the Fiji Girmit Association who performed a ‘pooja’ on the wreck. The survivors were carried by boats and Fijian canoes to Nasilai village. The last rescue boat reached the village at 8 p.m. The next morning they were taken to Nasilai Immigration Depot and then to Nukulau. Fifty-six passengers and three crew members died in the wreck but a further eleven died in the next fortnight due to complications resulting from their experience.